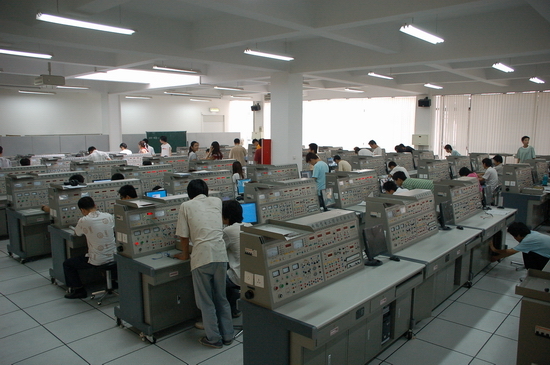 The School of Mathematics and Physics in North China Electric Power University was founded in 2003. Its predecessor was the teaching and research section of mathematics and physics, in the Basic Department in Beijing Electric Power Institute, established in 1958. At present, the school sets up one Doctor's degree authorization secondary discipline of system analysis, operations and control, two Master's degree authorization primary disciplines of mathematics and physics, five Master's degree authorization secondary disciplines of computing mathematics, applied mathematics, operations research and control theory, theoretical physics, condensed matter physics (The applied mathematics and theoretical physics are the key disciplines of Hebei Province), the professional master's degree of Applied Statistics authorization, two undergraduate programs of information and computation science and applied physics. There are 814 students in the school now, including 209 Master degree candidates and 605 undergraduate students. Five teaching and research sections have been set up in the school, including advanced mathematics section, applied mathematics section, information and computing science section, applied physics section, basic physics section, probability and mathematical statistics section. Many research Institution, such as science and applied computing, application of probability and statistics, materials physics, computing mathematics, applied mathematics, theoretical physics, optics research, provide a good platform for talents cultivation and academic research. The mathematical modeling innovation base, information and computing science laboratory, physics laboratory, innovative physics laboratory, computing physics laboratory and many other experimental teaching platforms have also been established. The school has 185 staffs, including 36 professors, 59 associate professors, 6 doctoral supervisors and 82 master tutors. There are 1 talented people in the new century of the Ministry of education, 1 Beijing cross century talent, 2 teaching famous teachers of Hebei province, 5 teaching famous teacher of North China Electric Power University. In the past 5 years, the school has 47 grants of National Natural Science Foundation of China, 13 grants of provincial and ministerial research projects, with a total funding over 20 million. There are 679 papers have been published in the important journals at home and abroad, 305 papers among them are cited by Science Citation Index. In addition, 40 Invention patents and 65 utility model patents have been authorized. The School of Mathematics and Physics adhere to the discipline construction as leader, talent training and scientific research as the core, closely be around the country's major strategic needs of energy and electricity, and constantly improve the technological innovation ability. After years of construction, the staffs have reasonable age structure, young and middle-aged teachers as the academic backbone, with good ethics and higher level of teaching and research.